are over 8,500 non-profit groups in the AWG trade area that participate in the program. These groups earn $.03 for each Best Choice UPC symbol redeemed, with a minimum of 1,000 labels required for redemption. This program represents more than 1.2 million cases of Best Choice products purchased by consumers in one year! 1. Raise Money for Your School or Any Non-profit Group. Together we can work to make a difference. It’s easy, just save labels for cash. Just save the labels of Best Choice products. Be sure to save the UPC portion (proof of purchase). Your school will earn $30 in cash for each bundle of 1,000 UPC’s sent to us. 3. Where to Find Best Choice? You will find more than 3,250 Best Choice items at over 3,800 stores in 23 states. Best Choice Products carry a 100% Quality Guarantee which assures satisfaction with every purchase. To participate, complete the registration card today. Upon approval, your group will receive an information packet as well as a Bonus Certificate. Due to program success and fast growing membership, the turnaround time can be up to six weeks. To download redemption form click here. To view program’s official rules click here. To view program’s legal guidelines click here. How should I wrap my labels when I send them in? We recommend putting each 1,000 labels in a sealable bag, envelope or secure with rubber bands, whichever is most convenient. Please indicate the number of labels you are redeeming. Can I send in more than 1,000 labels per year? Yes, please submit as many bundles of 1,000 labels as you can! Do we have to send in whole labels? Just cut around the UPC symbol. It’s not necessary to send in the whole label. How should I mail the labels? We recommend selecting a method of mailing which provides you with a receipt of delivery, such as Certified Mail. Neither Best Choice, Save-A-Label, nor its affiliates, shall be responsible for labels not received by Best Choice Save-A-Label, at the address herein, nor will redemption there of be honored. Once your group is registered, you will remain in our files. How do I know if it’s a Best Choice item? The Best Choice labels currently are being redesigned. In most cases, the words “Best Choice” are printed above the UPC symbol. May I send in Always Save labels with the Best Choice labels? 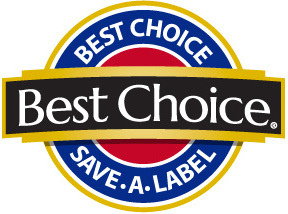 Only Best Choice labels may be used for the Best Choice Save-A-Label Program. Do I receive a Bonus Certificate every time I send in labels? Can my redemption form be used in place of the Bonus Certificate? No. The Bonus Certificate is specially printed with your group’s name and account number. Returning the Bonus Certificate with your 1,000 labels is the only way to receive the extra $30. We were unable to save 1,000 labels last year. May I still receive credit for the expired Bonus Certificate? No. The Bonus Label Program Certificate is only redeemable from January 1 to December 31 of each year. Keep in mind, however, a new certificate is issued to your group at the end of each year for the coming new year. What is our participation number?